Qubes 3.2 has support for USB passthrough. This one feature has made Qubes so much more useful for me. It means that a wide variety of devices — from my laptop’s internal webcam, to plugging in smartphones to transfer data or do Android development — are finally supported. I used to have to use a separate non-Qubes computer for several tasks that I can now more conveniently and securely do within Qubes. One way that I use USB passthrough on a daily basis is with my Yubikey. 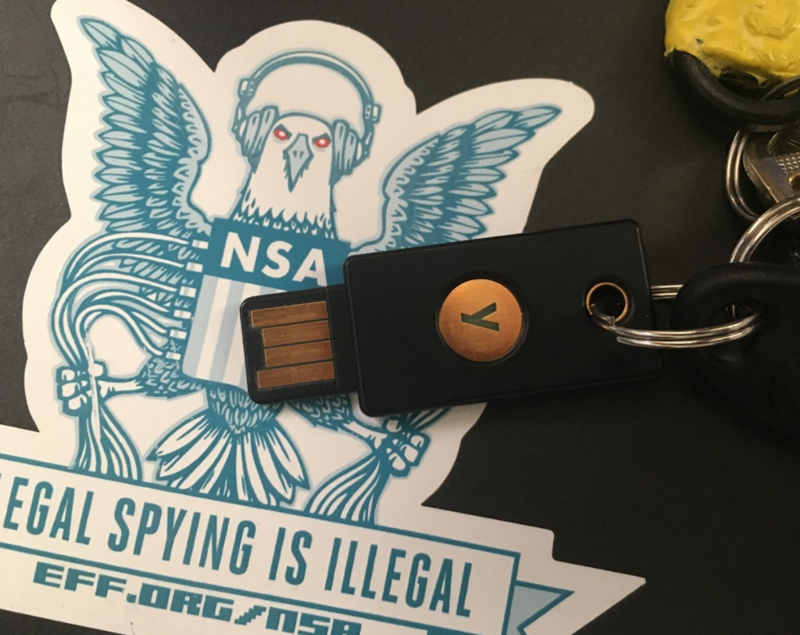 (If you’re unfamiliar, Yubikeys are small USB devices that can be used for two-factor authentication, for storing and typing static passwords, and for OpenPGP smart cards.) Normally when you use GnuPG, you keep your secret key in a file stored in ~/.gnupg. If you use an OpenPGP smart card, you don’t have your secret key on your computer at all — instead you have it stored on your smart card. With a smart card you can use your secret key, by decrypting or signing messages, but it’s designed to be impossible to export the secret key itself. If you use the Qubes split-gpg setup, where your email client is in a VM with internet access and your ~/.gnupg directory with all of your keys in a separate VM without any network access (called, for example, gpgvm), you’re going to need to attach your Yubikey USB device to that VM every time you plug it in. And, because of how the qvm-usb tool for USB passthrough works, the command you need to run to do this will be different depending on which USB port you plug your Yubikey into. qvm-usb |grep $USB_DEVICE | grep "(attached to gpgvm)"
One final note: When you plug your Yubikey into your computer (and you’re using a USB qube), a question might pop up in a dom0 window asking if you’d like to allow the USB keyboard you plugged in to sys-usb to type in dom0. This is because Yubikeys advertise themselves as USB keyboards — this makes it possible to press the button on the Yubikey to type a two-factor authentication code. This means never allow keyboards in gpgvm to type in dom0, and for all other situations ask. What are your thoughts on Yubico's move? So grepping for "Yubikey" is probably specific to that type of key from the company Yubico. Now that Trezor hardware wallet supports GPG do you think that is more secure to use than Yubikey? What if one wants to allow keyboard and mouse directly to dom0 but doesn't want them to pass through sys-usb (using mouse->sys-usb makes the mouse pointer incredibly slow and buggy)?